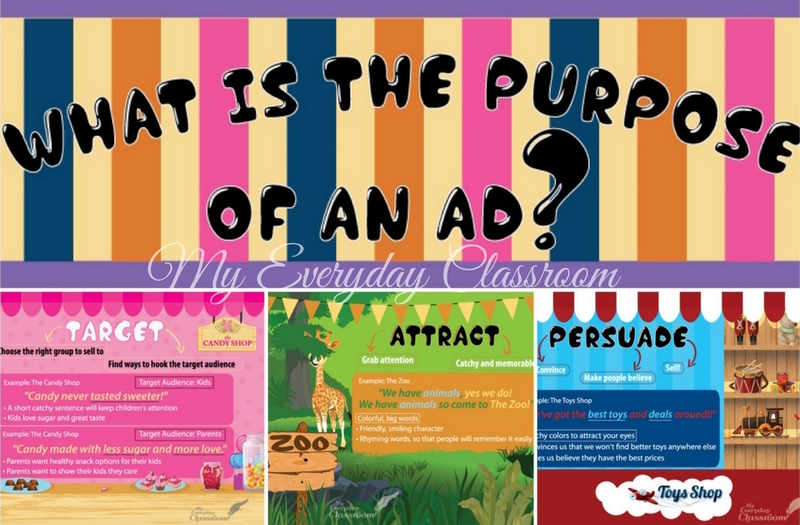 Teaching kids the ins and outs of advertising can be a lot of fun, especially since marketers can target kids so effectively. 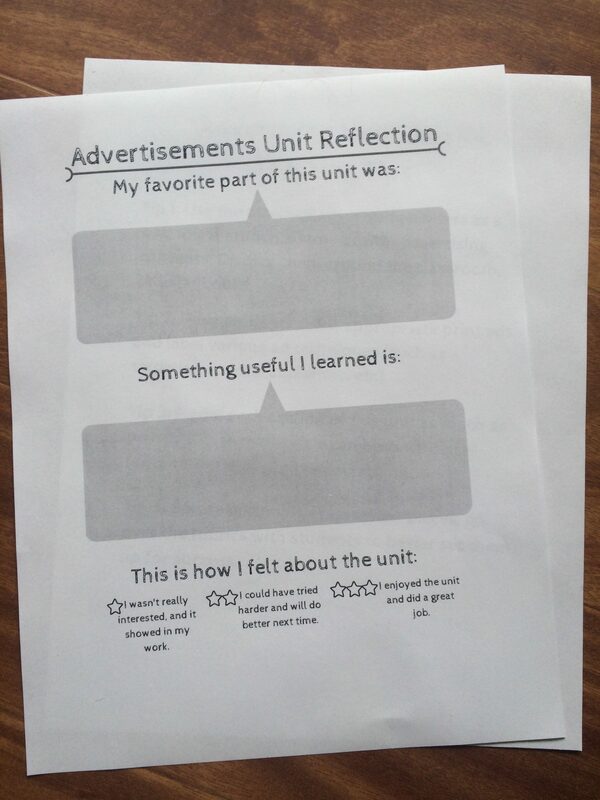 I’ve noticed that students love media literacy topics, especially the idea of creating their own ads. 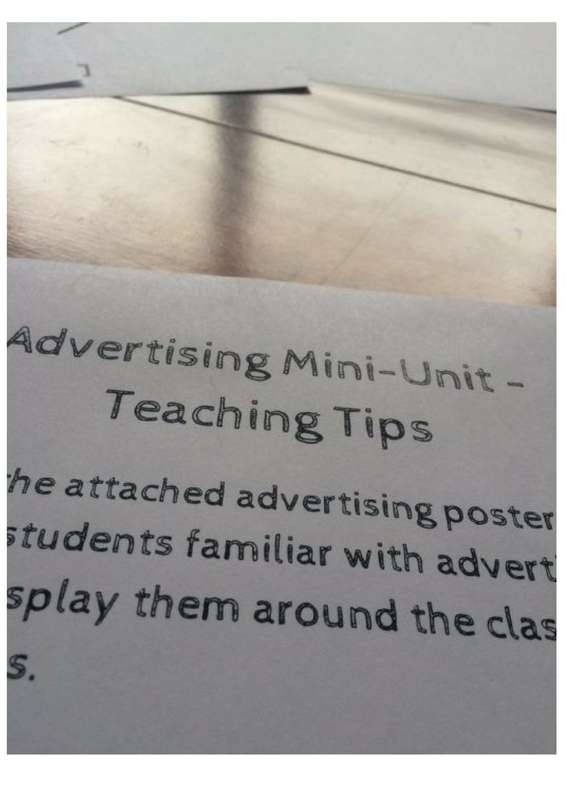 That’s why I’ve come up with the perfect advertising unit for your students. The unit package includes a great classroom poster to display on your bulletin boards. Each segment you see here prints separately and has catchy words, colorful designs and examples! After going through the posters and discussing ad techniques, it’s time to start the unit! First things first, go through my teaching tips. 🙂 I’ve got you covered. In the first section, students are asked to plan an ad meant to attract customers. 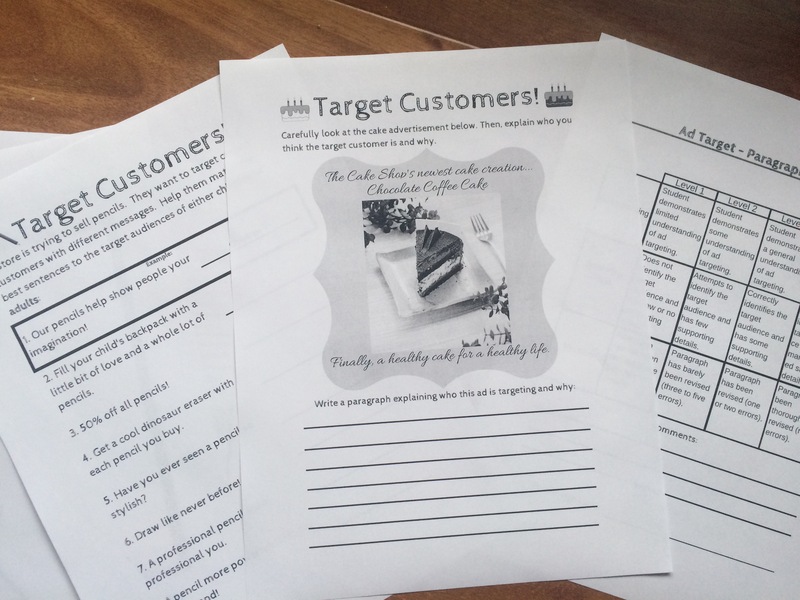 They start off with a graphic organizer to help effectively plan just how they will attract buyers. Here you can conference with students and provide them with feedback, or have them do peer conferencing! Next, the kids create their ads, with a handy checklist at the bottom to help aid in their success. Oh, and there’s a rubric for you to provide feedback or use this as an assessment. Next up, is all about targeting a specific audience. Students first practice matching ad phrases with their appropriate audience targets. Then, they put their knowledge to use and explain which audience an attached ad is targeting, and why. This includes another rubric, which ties in a writing element. Hooray for cross-curricular! The last element to practice is about persuading customers. 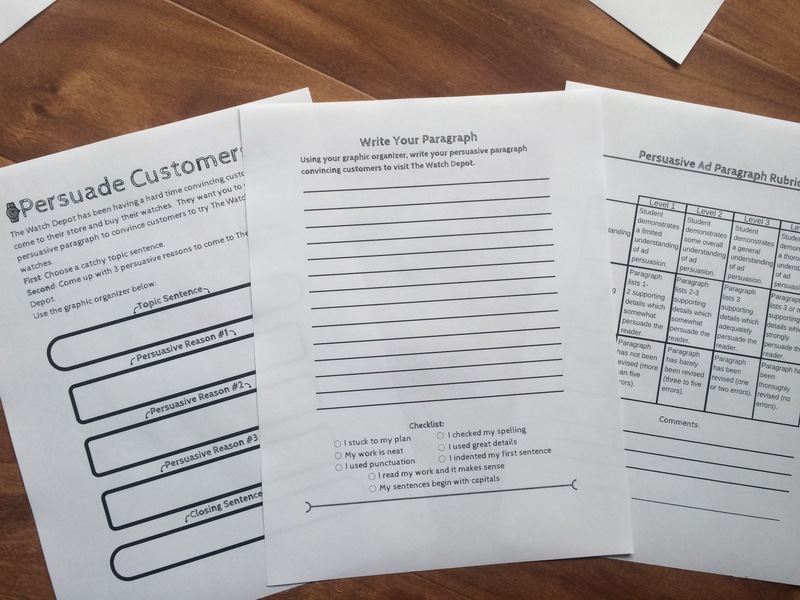 Students are asked to come up with a persuasive paragraph, convincing customers that they need to buy a specific product. 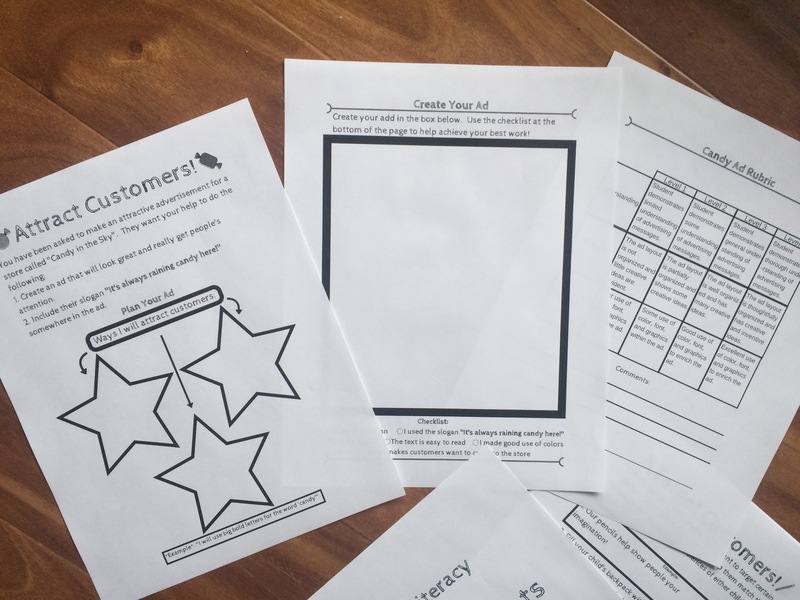 Kids are guided with their graphic organizer, and yet another checklist to help them achieve success. 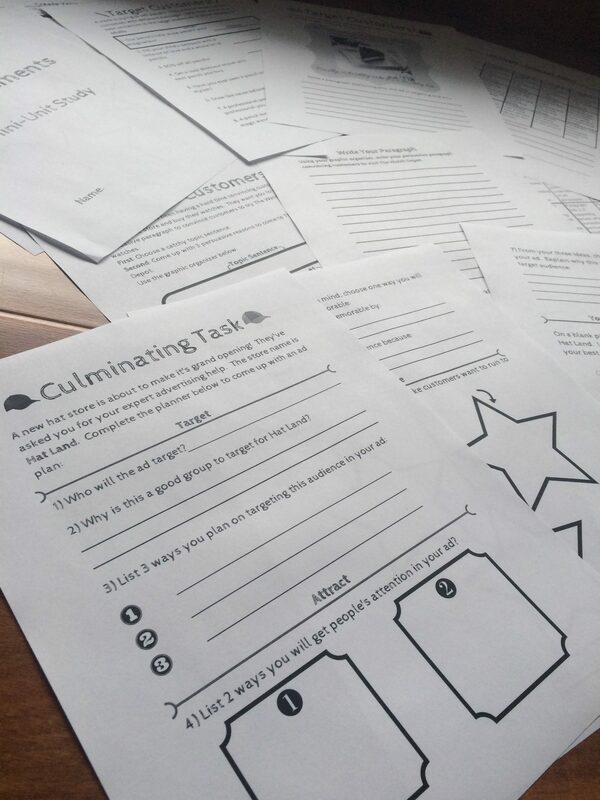 Last but not least, tie in all your students’ learning with a culminating task. 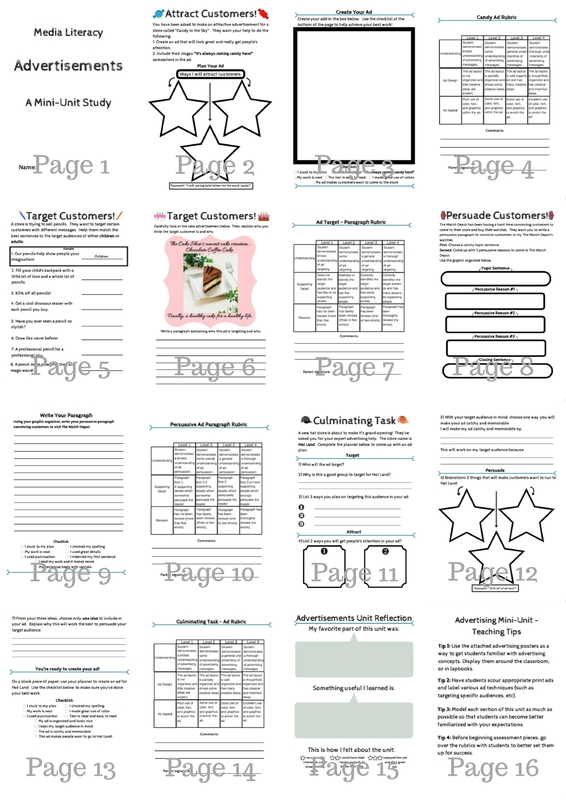 The culminating task is meant to bundle attracting, targeting and persuading ad techniques to show off just what the students have learned. This section is filled with guiding assistance to help students create their own amazing ads. Afterwards, proudly display the ads on a bulletin board. This section also comes with a rubric. I’ve included a student reflection sheet to help provide some closure to the unit. Here is an overview of all the pages in this package (excluding the posters – which are also included when you download the package from TPT).